This unique Palace enamel-on-glass bottle dates from the mid- to late- Qianlong period. It is obviously related to a porcelain equivalent illustrated by H. Moss in Chinese Snuff Bottles, No. 5, p. 28, fig. 17, which is of similar form. The porcelain version was dated there to the Daoguang period, but today would be ascribed to the late Qianlong period. The Qianlong Emperor sometimes took works of art from his Palace workshops and ordered copies made at Jingde Zhen, and it is likely that the design concept for the porcelain bottle was inspired by this one. Another enameled glass bottle from the Mullin Collection in the form of a gourd is also known, ibid., p. 27, fig. 12, and closely relates to the present example. 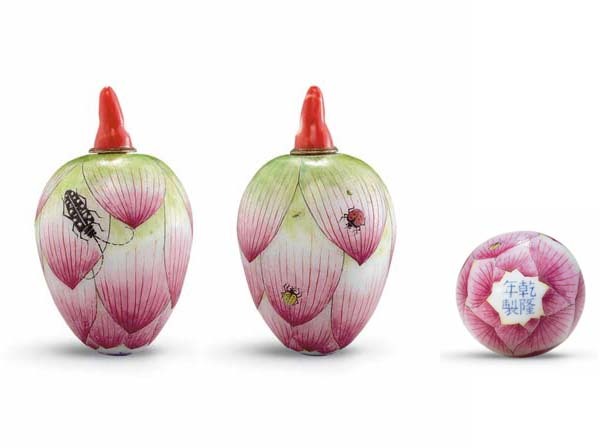 The enamels and the manner in which they are used, particularly in the use of a red line over a pink wash to depict lotus petals, suggests a link between this bottle and the Guyue Xuan group of enameled wares made for the Court between 1767 and 1799 (see H. Moss, "Mysteries of the Ancient Moon", JICSBS, Spring 2006, pp. 16-7). Apart from its rarity in both form and decoration, this example has survived in remarkably good condition and was probably protected in the Imperial Collection until the late-Qing or Republican period, by which time it would already have been a valuable collectors' item and spared the dangers of an extended period of use as a snuff bottle. The lotus is a symbol of integrity, as it blossoms unsullied by the muddy water from which is rises, while the ladybirds and beetle are signs of fertility.